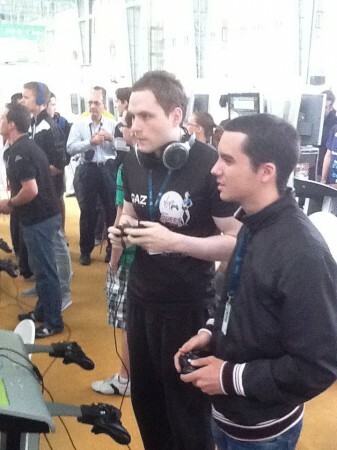 Last weekend Team Sweetpatch TV player Gary Harvey made it in to the last 8 of the FIFA 12 tournament @ Campus Party. Check out his full review of the tournament as 3 UK players finished in the top 8. Wednesday was all about going to the venue and seeing what it was all about but when arrived I noticed that we were going to be playing on stand up pods which I wasn’t over the moon about having to stand up for long periods especially in BO3 double elim. So checked venue out then headed back to hotel for some practice in the Hotel room before the morning games started. Got to play 2 game’s then Henrique10 the guy I was sharing room with accidently knocked my Xbox over and lazer burned my Fifa 12 disc which wasn’t so good but just had to laugh as everything was going wrong from bag to this haha. Thursday morning came so was up early to get breakfast and headed to tube station to event. Arrived early so there was a little hanging about before we started at 11.15 and was feeling really good about my chances of getting to Saturdays Finals. My first match was easy enough with 2-0 win in games then played someone that went Brussia Dortmund I went Madrid all through comp so first match was struggle at start but got through it with 4-2 win. Then 2nd match was 8-1 which ment I won 2-0 in games and made it to Quarters winners bracket. My third match was against a good player called P3rti from Spain, well people were saying he was good so had to be on my game. He went Man City I went Madrid first game was 4-1 to me and 2nd was 3-1 so got through to Semi Final against Western Wolves player Krasi who has been performing really well at events on Fifa 12. You can check out my qualification bracket here. Saturdays Finals-Headed to venue really early only time for Banana for breakfast we had to be there for 9am est. My first match was against Western Wolves player WickyBG who is well known in Fifa scene. First match was really tight 2-2 after 90 mins so had to head to extra time which I sadly lost 4-3. Then next match lost 3-1 but couldn’t complain as he took his chances I never.